Toxicity levels vary depending on the species, the size, and the metabolic rate. The fish’s metabolism is more active in higher temperatures then in cooler environments, which allows toxins to act faster. Toxic substances come in contact with the fish through the gills, rather than the skin. This allows most toxins to act very rapid as they enter the bloodstream of the fish very directly. Any degree of poisoning will weaken the fish, making it vulnerable toward disease. Ammonia is highly toxic to any fish. Reasons for an ammonia poisoning include a new set-up (nitrogen cycle), an interruption of the beneficial bacteria (i.e. power outage, medication, filter exchange) or a change in the bio-load, if too many new fish have been added to the aquarium too quickly. The signs are a lethargic motionless fish hovering at the bottom of the tank, red gills and a lack of appetite. Advanced cases will show bleeding gills as well as external and internal bleeding toward the final stage before resulting in death. 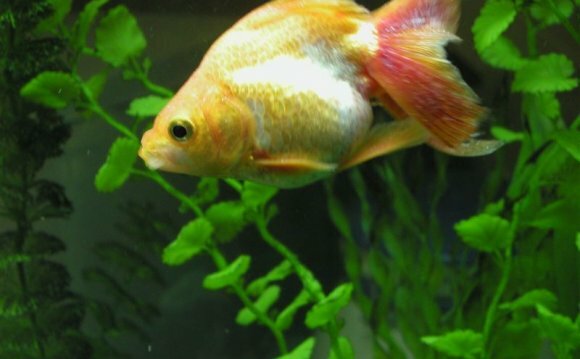 In addition to a water change, first aid can be given by lowering the pH to 7.0 or less. Toxic ammonia changes into ammonium at this level and is, at this stage, harmless and non-toxic. PH can be lowered by using distilled water for the partial water change. Nitrite is less toxic then ammonia, but still poses a significant health risk to the fish, and can be deadly in high doses or over long periods of time. Fish gasping for air at the water surface could be a sign of nitrite poisoning. Nitrite enters the bloodstream of the fish and binds hemoglobin cells – the oxygen carrying vessels of the fish’s body. In other words, high nitrite levels will suffocate the fish. The cause for nitrite poisoning is the same as described with ammonia poisoning. 1 teaspoon of salt per 300 Gallons of water can help the fish to cope with nitrite toxins. CO2 levels in excess of 25-30 ppm are dangerous for fish. Common signs for CO2 poisoning are an increasingand more rapid breathing, gasping for air, and a staggering swimming behavior – all leading to suffocation of the fish. CO2 poisoning can be caused by a malfunction of the CO2 reactor, or the inability of plants to absorb CO2 if the lighting is insufficient. A quick and long lasting solution is to heavily aerate the tank through surface agitation and air-stones. This will cause the CO2 to dissipate from the water. In rare occasions, such as a severe lack of maintenance or an extended power outage, hydrogen sulfite can be formed in the gravel or within the filter. Hydrogen sulfite can be detected by its rotten egg like smell. Hydrogen sulfite transforms iron within the blood cells into sulfide which will lead to suffocation of the fish. The warning signs of hydrogen sulfite are the same as with nitrite poisoning in addition to the rotten egg smell of the water. Prevention is crucial; the gravel should be cleaned on a regular basis. In case of a power outage, the filter has to be rinsed out well, before re-starting it. This will help eliminate the toxins that are in the filter, instead of washing them into the tank. All three of them are in general of no concern as the water usually is treated with a conditioner prior to use, eliminating this problem right from the start. Most tap water (city water) is treated with chlorine/chloramine to make it safe for human consumption. Unfortunately, our wet pets do not appreciate that. Chlorine/chloramine poisoning has similar signs as associated with nitrite poisoning. Chlorine/chloramine irritates the gills and blocks the oxygen carrying cells, again leading to suffocation. Additional to the fish gasping for air, a chlorine odor can be detected. If so, adding a water conditioner is imminent, as chlorine/chloramine can kill all fish within 24 hours.